Myriads of schools, universities and institutions are seeking effective and modern ways to create a beautiful and modern website without spending too many resources. An attractive, feature-rich and intuitive WordPress theme can help with that. Instead of going for just any standard WordPress theme, organizations can greatly benefit from having a personalized WordPress theme, designed deliberately for the education sector. In this article we are going to present what we consider to be the 10 best WordPress themes for schools, universities and institutions. Education WP is one of those power-packed WordPress themes that offer everything you’d need for an education-based site. Incorporating all-new LearnPress 3.0 plugin, the Education WP is a highly customizable, user-friendly theme with outstanding UI/UX. The theme offers best LMS experience and is packed with multiple eLearning features. With Ivy League Demos and WPBakery Page Builder, Education WP theme happens to be lightweight, stable and faster altogether! Not to mention, it offers 17+ demo layouts and 14+ premium Add-ons to choose from and customize the site as per your own choice. 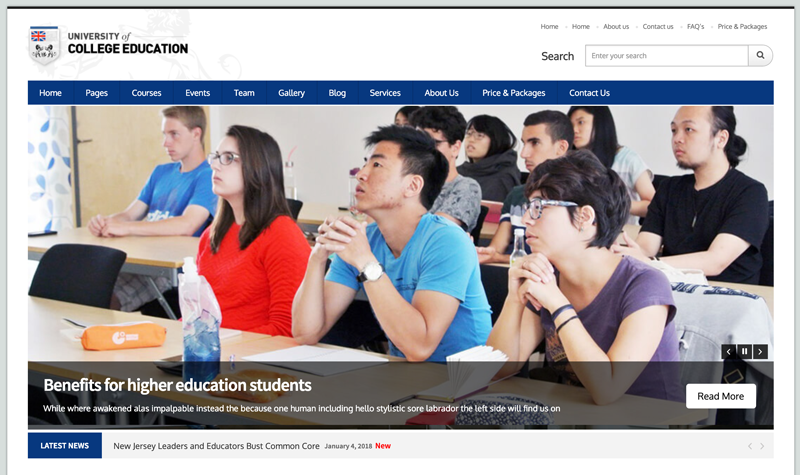 Overall, Education WP has a warm, clean and welcoming design that is sure to appeal visitors. 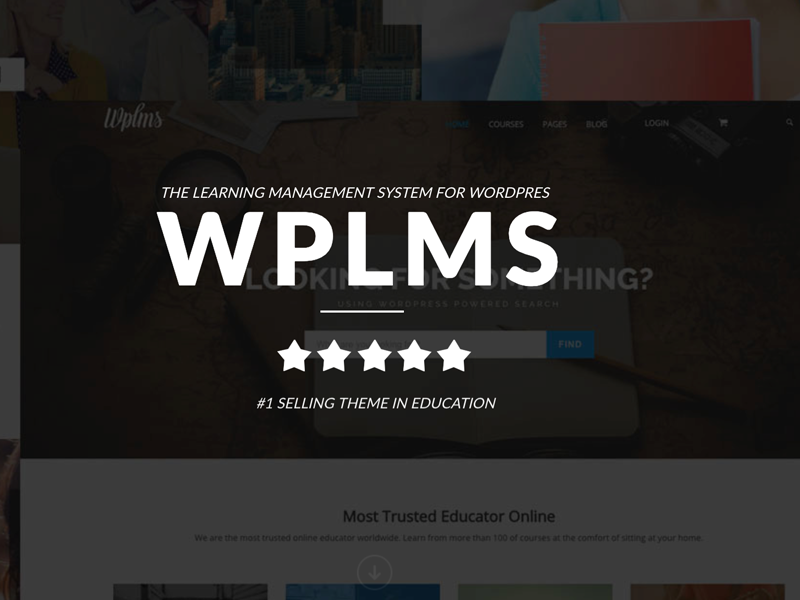 WPLMS is not just an education theme for WordPress, rather it’s a complete eLearning suite. Its modern configuration has been deliberately designed for educational organizations that want to create and sell courses online. WPLMS is a scalable, secure and flexible platform featuring over 700+ design layouts and 8 stunning demo sites. It comes with Front-end Course Builder that lets you create Courses/Units, edit them, set up Course groups, Forums, Prices and so much more. One-click data import helps you import demo data and set up your theme within 5 minutes! Multiple customization options further offer you complete control over personalization of the site. WPLMS is compatible with several premium plugins, including BuddyPress, WooCommerce, Visual Composer and Layer Slider. Buntington is a bold and colorful education WordPress theme, designed for universities, schools and academies. You get to build pages with SiteOrigin Page Builder allowing advanced Drag-and-Drop Content Creation, be it Front-end or Back-end! Developers have built this theme on Bootstrap and Vafpress Framework. Another highlight of Buntington theme is the Kirki Customizer that lets you entirely customize the look of theme via front-end and you’ll see live preview there and then. With that, Buntington theme is packed with over 2000 icons, more than 15 SiteOrigin-complaint widgets, hundreds of Google fonts, WooCommerce support, Cinema Header, full documentation and you get to design your own Header and Footer as well. Design of Buntington theme is fully responsive and effortlessly adapts to small devices. MasterStudy is another premium WordPress theme that’s highly intuitive, fast-loading, easy to use and attractive. It features amazing scrolling effects, friendly fonts, bright colors and beautiful icon styles. 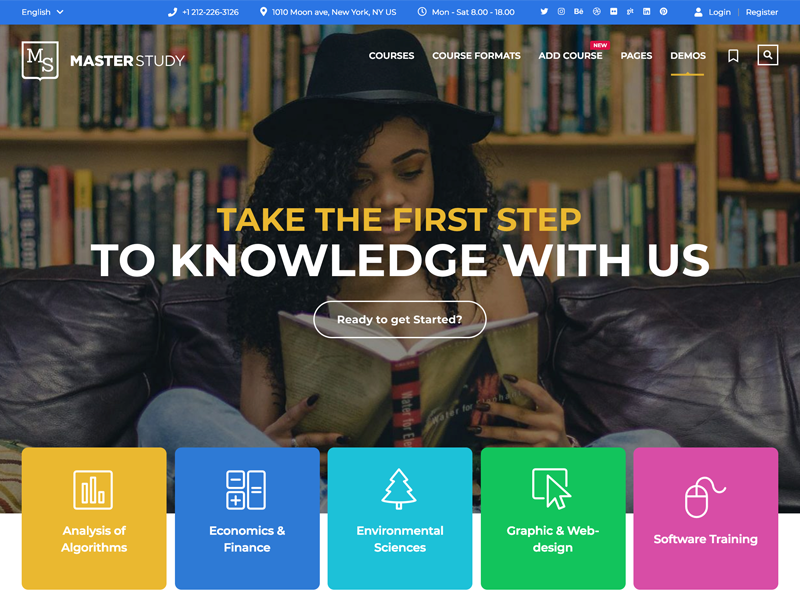 Built on Vue.js, the Masterstudy theme lets you create a vibrant learning hub for students, be it free or paid. It includes Masterstudy LMS Plugin for online courses, whereas WooCommerce support allows for Offline Courses. With Revolution Slider, you can create stunning and dynamic sliders with various animation effects. You can also set up course purchase with PayPal or Stripe options and your students can leave Course Ratings as well. Main highlights of Masterstudy theme would be 800+ Google Fonts, Integrated Mailchimp subscription, Visual Composer Page Builder, Custom Sidebars/Widgets and One-Click Demo Import. Eshkool is another clean and modern-style Education & LMS WordPress theme, suitable for any educational institution. It includes 9 unique HomePage demos with multiple LMS course page layouts and different inner pages layouts. All of these can be easily edited and customized as per your requirements. Feature-rich theme comes with WPBakery Page Builder, Revolution Slider, premium LearnPress plugin for LMS, WooCommerce plugin and Redux Framework. Eshkool is built on Bootstrap 3.6.x. to make it responsive and powerful on all smart devices, including PCs, smartphones and tablets. It is clean coded and well documented, so you can customize it further. Eshkool is WPML-Ready and features RTL support as well. Ivy School is a captivating and engaging theme with amazing UI/UX to build educational, School websites. It is bundled with best, premium add-ons for LearnPress in order to support LearnPress plugin. Ivy School theme comprises of 4 beautiful pre-made demos, 20+ Pages (Blogs, About Us, Our Team, Services, etc.) and WPBakery Page Builder for quick customization. It allows for Amazing Parallax Effect and lets you create responsive site with over 1200+ icon options and 600+ Google Font options. Retina-Ready and fully-responsive design of this theme can be viewed on any smart device. Ivy School is highly customized for SEO and loads faster with Ultra-Speed. With One-time Payment, you can use this theme for Lifetime with updates. 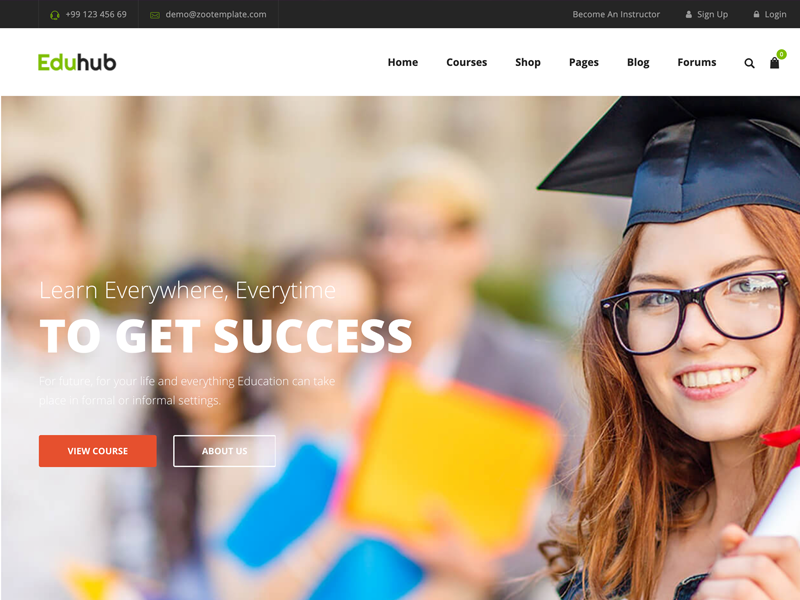 Another interesting contributor to the 10 Best WordPress Themes for Education is Eduhub, which is yet another powerful LMS (Learning Management System) for WordPress with which you can create websites for Training centers, Courses hub, Academy, School, University, Business and even Shopping. Latest version of Eduhub comprises of WPBakery Page builder and Revolution Slider with which you can give amazing look and stunning effects to the site. With Sensei Plugin support, users can create courses, write lessons and add quizzes to the site, whereas bbPress support allows you to set up Course discussion forums. Eduhub is WooCommerce-ready and RTL-supported as well. Tutor Pro strikes perfect balance between professional and beautiful design with powerful features. The theme looks clean and elegant altogether. Latest version of the theme is compatible with Visual Composer, so you can create your own layouts in no time! 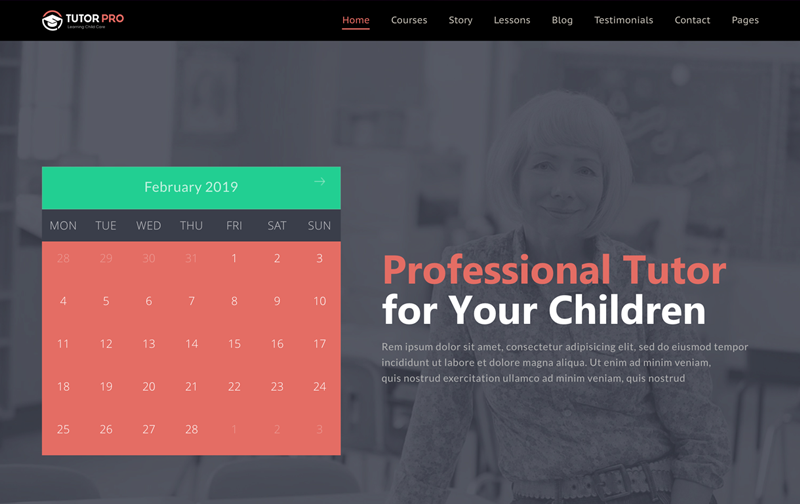 Premium highlights about Tutor Pro are its Responsive, Retina-Ready design, Faster loading time, Powerful Options Panel, SEO-friendly design, Full documentation, amazing UI//UX and Social networks links support. Tutor Pro is a perfect theme for tutoring centers, colleges, schools, child care centers and even private instructors. 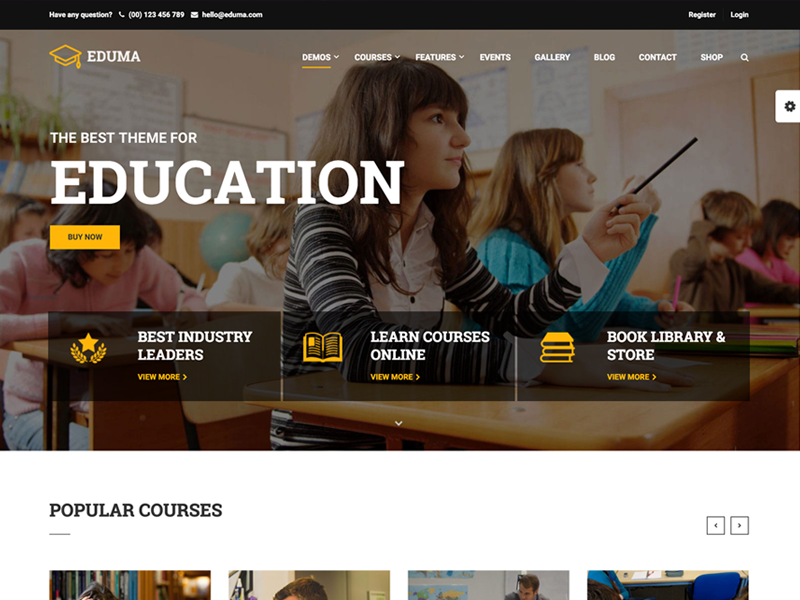 Build by Chimpstudio, University theme is a fully customizable, clean and elegant education theme. It is power-packed with features so you can create Online Courses, Events, Teams, Galleries, Advanced Admin Panel and much more for your institution. University has fully-responsive Sliders that work smoothly even on small devices. 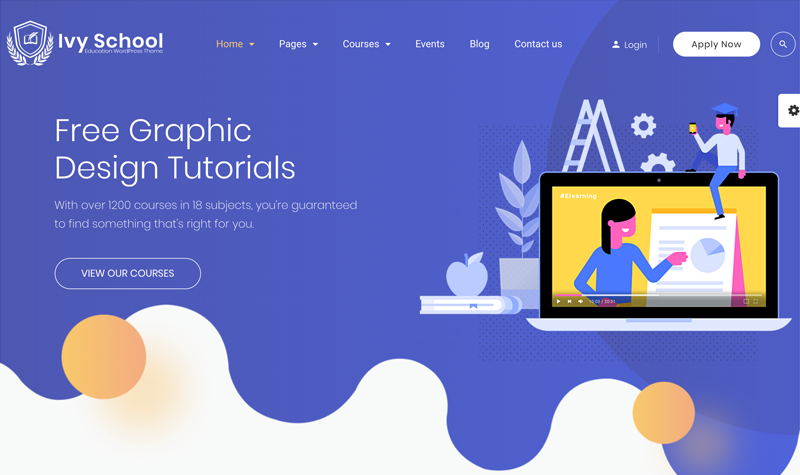 Advanced Page Builder, Unlimited Sidebars, Shortcodes Builder, Unlimited colors, Unlimited Fonts, all of these make University one of the greatest education WordPress themes! Also, your site can be translated to any language through WPML plugin. All-in-all, University is simple yet highly functional and feature-rich theme that lets you create website for any educational organization. 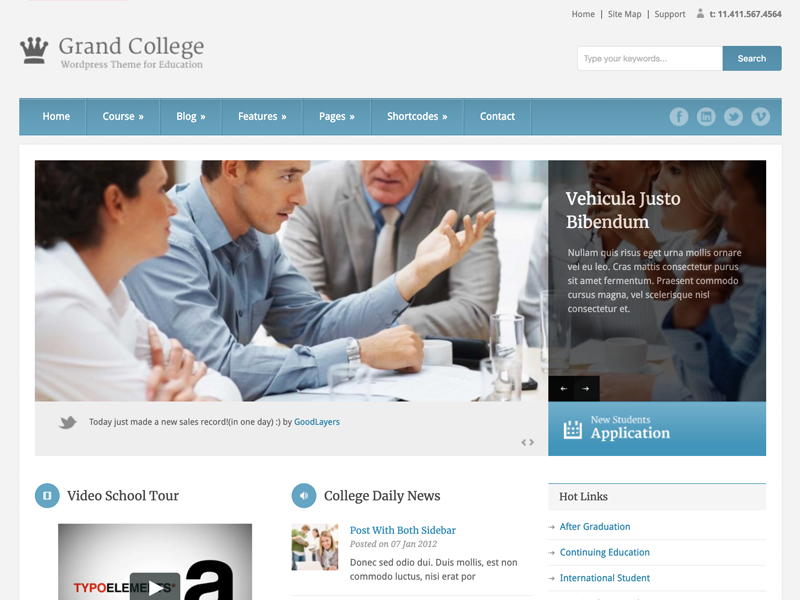 Best Education WordPress theme list feels incomplete without Grand College. It has clean design that’ll appeal readers and it comes with broad range of features. Grand College is highly customizable as it allows you to change almost all elements on the page via Drag-and-Drop builder. For full customization, it includes 15 pre-defined background patterns, 4 blog styles, 6 Footer layouts, 450+ fonts and 3 Thumbnail options (Video, Static Image, and Slider). Six Custom Post Types would be Gallery, Portfolio, Testimonial, Personnel, Course and Price Table. Overall, Grand College is the best theme for College, University, School or even businesses, as it is SEO Optimized and has .pot file for localization as well. 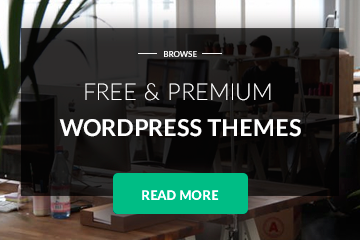 Which WordPress theme should you go for? To sum up, all of the above-mentioned education WordPress themes are best to create an educational website. If you are looking to create an attractive and intuitive website for your institution, these themes will be a great and welldesigned helpers. Go ahead, select your best education WordPress theme and create a professional website in no time!